NZD was getting weak against USD due to the FBI report concerning Hilary Clinton. 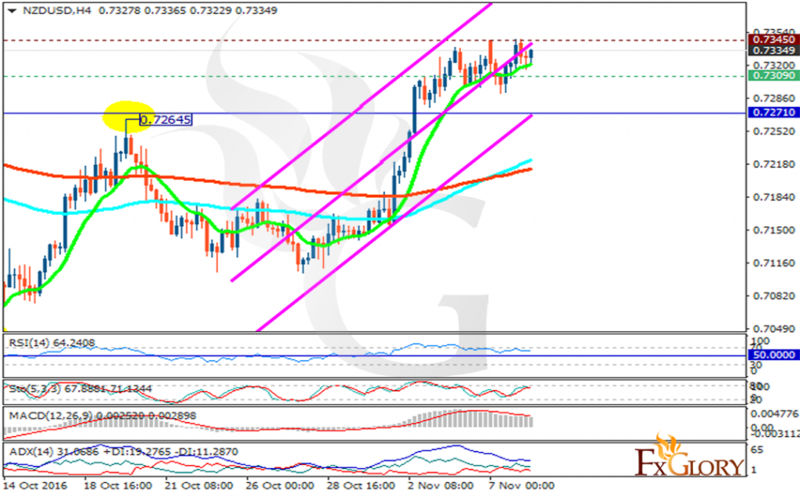 The support rests in 0.73090 with resistance at 0.73450 which both lines are above the weekly pivot point at 0.72710. The EMA of 10 is moving with bullish bias and it is located above the EMA of 100 and the EMA of 200. The RSI is moving horizontally in overbought area, the MACD indicator is in positive territory and the Stochastic is moving in its maximum rate. The ADX is showing stronger buy opportunity than sell. In case of the resistance level breakout, long positions are recommended targeting 0.7400.